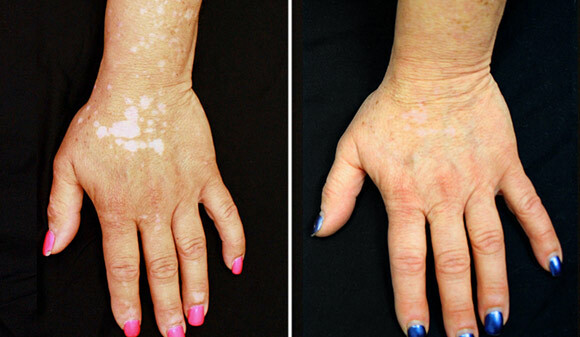 Left hand of vitiligo patient before and after treatment with tofacitinib. New research from Yale University demonstrates the effectiveness of tofacitinib for treating vitiligo. After five months of treatment, the white spots on the patients face and hands were nearly gone and tofacitinib caused no adverse side effects during the course of treatment. shows that Within two months of treatment, the patient experienced partial repigmentation on her face, arms, and hands — the areas that concerned her most. After five months, the white spots on her face and hands were nearly gone, with only a few spots remaining on other parts of her body. A medication for treating rheumatoid arthritis has restored skin color in a patient suffering from vitiligo, according to dermatologists at Yale School of Medicine. The disfiguring condition is best known as the disease that plagued late pop star Michael Jackson. The finding was published June 24 in JAMA Dermatology. Vitiligo is a common, psychologically devastating condition that causes skin to lose its pigmentation or color. Current treatments, such as steroid creams and light therapy, are not reliably effective in reversing the disease. Recent advances in vitiligo research led Yale investigators to consider an existing class of FDA-approved medications known as Janus kinase (JAK) inhibitors, as a possible treatment. Last year, Dr. Brett King, assistant professor of dermatology and principal investigator of the research, broke new ground when he published a paper demonstrating the effectiveness of the JAK inhibitor tofacitinib citrate in treating hair loss caused by alopecia areata. King and co-author Dr. Brittany Craiglow, believed the same medicine might be effective for vitiligo. To test the hypothesis, King and Craiglow administered tofacitinib to a 53-year-old patient with prominent white spots covering her face, hands, and body. For more than a year prior to taking tofacitinib, the numbers of these white spots had been increasing. Within two months of treatment, the patient experienced partial repigmentation on her face, arms, and hands — the areas that concerned her most. After five months, the white spots on her face and hands were nearly gone, with only a few spots remaining on other parts of her body. Notably, tofacitinib caused no adverse side effects during the course of treatment. The results could represent a breakthrough in vitiligo treatment, say the researchers. “While it’s one case, we anticipated the successful treatment of this patient based on our current understanding of the disease and how the drug works,” said King. King said further research would be necessary to confirm the drug’s safety and efficacy and cited work by University of Massachusetts Medical Center dermatologist and scientist John Harris as the inspiration for trDr. Brett Kingying tofacitinib in this patient. “It’s a first, and it could revolutionize treatment of an awful disease,” said King. “This may be a huge step forward in the treatment of patients with this condition.” King hopes to conduct a clinical trial using tofacitinib, or a similar medicine, ruxolitinib, for the treatment of vitiligo. Be the first to comment on "Study Shows Arthritis Drug Restores Skin Color for Vitiligo Patients"